Text from Brian O'Doherty, "The Voice and the Myth: American Masters"
"Anyone who has seen de Kooning painting will have noticed he often puts a lot of time into one part. The artist at work is a fetish of modernism. Instead of an artist painting a picture, we have a picture painting a mythic artist. This confuses the simple act of looking at someone working on a picture. If we remove the expectations the myth creates, all we see is a man stuck on something, a man who has lost his freedom. Instead of the myth "de Kooning," we see a puzzled biped. Instead of a mythology of "action," we notice certain things happening. "The sight of this creature painting one corner over and over makes us curious to know what is going on there. If we examine the matter closely, it seems that one stroke is being repeated - the same stroke, or one very close to it. Maybe the biped does not know it's the same stroke. Or maybe he can know it is only by repeating it. Here the possibility of an infinite regression opens up. Such regressions are a form of imprisonment (as well as a form of vanishing point), but what is imprisoned, among other things, is a terror of change. This is produced by, and produces, a wish to control it. That very wish masks a desire for change, a desire to escape. For each stroke, as much as being a reconfirmation of the old, wants to be completely new - that is, unrelated to the previous stroke. Yet this can only be confirmed by the previous stroke. Exact repetition perfectly renews each moment even though it is a fake newness. So such fragments of a de Kooning contain a nascent Warhol. For Warhol's soup cans solve the problem of the new by completely forgetting a past which was exactly similar. Warhol repeats himself and is thus new. De Kooning tries to escape from the past and is thus tied to it. "If we further examine this de Kooning fragment (still from the mid-fifties), we find epigrams and puns in terms of painting itself, and quotations from the past. We find confusions about space and time experienced very lucidly. So the sight of de Kooning stuck in one corner is like watching a blind man. He can't - as far as we can see - tell one stroke from another, itself an exaggeration of not being able to tell one part from another, or one picture, or one period. For he sees history in terms of space, all of it simultaneous and contemporary. He paints on a canvas identified with the space of history. So now we have some idea of what de Kooning is doing in that corner. He is engaged in the absurd task of painting European art over again. He is putting periods, movements, centuries into a fragment. This is an appallingly near-sighted view of history - the view of a person for whom all history has turned into space and for whom space keeps turning into time, and who doesn't know, or chooses not to know, the difference. Paradoxically, this is a characteristic of the most ambitious and gifted, and it leads to repetition. Who could be more narrow than Michelangelo? "Why should anyone want to paint European art over again? Perhaps to make sure it exists. Perhaps to compete with it. Perhaps to correct it. This absurd ambition cannot be mocked, for the artist has mocked it already; laughter is an intrinsic part of de Kooning's work. From this absurdity we go on to de Kooning's periods, little histories within the larger idea of History, and to the only thing that would fit a person for the tasks he has undertaken - that confidence or ignorance that refuses to learn from the past, in a word, innocence. But innocence and laughter are mutually exclusive. They cannot engage in a dialectic, except by accident, when each fails to recognize the other. They appear and disappear in the work like different physiognomies. "Periods exist, however, even in a fragment of a de Kooning. (Indeed, all his work is a fragment of something else, so his sketches, which admit that, are more complete than "finished" work.) So we can say that his periods, though strung out in time, may appear simultaneous. In this way his periods begin to present a fake idea of periods, just as his pictures finally are imitations of pictures. Is this very periodicity, then, something he thought about in relation to the idea of mastery, and specifically in relation to Picasso? The idea of periods has been corrupted into the idea of progress, of avant-gardism in little. Each new period is "ahead" of the last. In this sense periods are a kind of striptease, each approaching some finality, the artist's "naked self." Perhaps, when the last thing comes off, there's nothing there. In this area Picasso's voice and myth were deeply confused. His periods were predominantly a way of wiping out, so that he could start again. But his periods, assimilated by myth, became a kind of reassuring clock on which to tell the cultural time. Picasso's final period, his final striptease act, was of course his death. De Kooning's periods are a more limited adaption of Picasso's example. If masters have periods, the idea of mastery is approached through parody, a parody careful not to destroy but to license that approach. De Kooning's "periods" are more truly oscillations. "There is an oscillation between abstraction and the figure; between all-over and focused space; between varieties of relative confusion and varieties of relative calm; between, finally, opacity and invisibility. There are also remarkably consistent themes-a persistence of certain habits and flourishes on the one hand and certain strategies on the other. We may also point to two persistent motifs: a woman, and an elbow-like brushstroke. And to certain moods: irritation and humor. And finally to a color: pink. And the ambition, however dissembled or cancelled, that tries to include all these, so that they can all be treated equally, like the spaces in which they are set. These, by and large, are what his "periods" take place against. Early Picassoid, with many Miró-Ingres variations. This often resulted in an exquisite hysteria - the pictures are falsely held together. The famous black-and-white paintings shown in 1948. Cubism is flattened into a kind of drawing with lines. An impetus is given to the lines so that the idea of movement enters, and with it the implication that space is being mobilized for some alternative purpose. Space begins to escape the lines, and thus has the possibility of describing them as much as the other way round. Space and line are made clearly ambiguous, that is, figure and ground. Black and white, of course, aid this. The flattened, jigsaw spaces (late forties, early fifties) are a kind of all-over Cubism expressed in a brusque shorthand. The paintings (Asheville, Excavation) are landscapes with figures in that all show a distinct compression of motif toward the top - that is, they have a right side up. Excavation, with its grasshopper strokes, is a kind of mercurial puzzle of slipping fragments. The Women reappear again. Systems are developed by means of a formal and metaphorical multivalence of parts - puns between ideas of form and content. A surfeit of such references introduces the possibility of paralysis. At the same time, and increasingly, the Gotham News period of the mid-fifties. Pictures are painted on top of one another, ambition and dreams of history are incorporated, and the idea of time as a form most clearly emerges. For a brief time brushstrokes enlarge and compositions have a cousinship with Kline's. There are traces of irritation, pockets of painting done over and over, but this is disappearing. The neo-Revlon period of the later fifties. Large brushstrokes simply coexist side by side. Ideas of movement are codified in terms of speed, direction, sprays, and sudden halts, etc. This suggests obvious ideas of process which were misunderstood both by artists and critics. What really suggests it is a new interest in the compression of time - whether it is possible to eliminate all the gaps by a disguise of instantaneity, so that the strokes simply stay side by side. The "process" idea could have been corrected by just looking at the falsity of these pictures. Their colors are highly artificial, variations of pink become a major theme. Pink is reminiscent of maquillage. These works appear fleshy, but they are really cosmetic, consciously false. This implies that the rhetoric of brushstrokes is not to be believed. Pastel colors are flirtatious and psychologically are associated with ambiguity. Highly vulnerable to misuse, these pictures were, inevitably, raped. The rococo of the sixties, with the predominant theme of Women again, but this time ludicrous goo-gooeyed creatures, often coming in pairs. The tones are higher, the values closer, figures and landscape interpenetrate. The brush slips and twists instead of developing magisterial tundras and sprays. "Many of these divisions are not divisions at all, since they shade into one another, or proceed concurrently, or are new ways of handling old themes. But cutting through all these divisions, false or not, is an approach to and a withdrawal from a climax - that Gotham News period of the mid-fifties. It is as if that climax called up a further tower of ambition, and the art, transfixed by it, could not proceed except by the pretense of unimportance. The informality of the work since then, as Harold Rosenberg pointed out, has been read as a decline. This myth contains a truth and distorts it. Though there has been a withdrawal from omnipotence, this withdrawal has a theme, a theme very much of its time, the sixties. "The sixties pictures are fragmentary, with few exceptions. The strokes are laid down side by side and areas of color do not disappear behind each other. Colors are high in saturation and closely valued. The pictures' flatness is accentuated by the frequently close values. A thin tissue of paint seems to have been rapidly wiped across the canvas. Pastorale (1963) is not a typical picture but it shows the idea. It also approaches invisibility. The instantaneity is another convention of time, as artificial as that of the mid-fifties. But instead of the picture being strung out in time, and hopefully obtaining its unity from this, it is now compressed into one instant. The gaps between strokes are not exaggerated, they are compressed. "If we compare Gotham News and, say, Pastorale, there is a reversal of method. In the earlier picture we discovered a chaos which the parts struggled to eliminate by a convention of extended time that constituted an appeal to history. In the later picture we see a single mood, a promise of unity. But when we look into it the parts still don't go together. Yet if matters are instantaneous the parts must stay together. There is an escape from history here. De Kooning, one might say, has discovered the present. "This aspiration clearly is contained in the earlier struggles with history, with reversible futures and pasts. It is signified even by subject and style, which in de Kooning's work we can consider as components of structure, The figure in these sixties paintings is a kind of Barbie-doll caricature of a fertility figure. Timelessness (instantaneity) is indicated by this icon, and it is introduced into the least demanding of histories, the rococo. It is a rococo that also signifies an escape from the artist's own past, for it parodies his own baroque period. So the escape is not complete. "Instantaneity is the structural idea against which these later fragments define themselves - just as the early work defined itself against Cubism, or rather a Cubist jigsaw cut and spliced into history. Instead of accumulating picture on top of picture, in the manner of Gotham News, the later pictures are dealt off one by one. Since they inflect the same theme again and again, their family resemblance is strong. The idea enters that he may not be trying to paint different pictures, but to paint the same picture, again a way of eliminating history. The bystander now has the problem of superimposing the images. This is clearer in the drawings, very puzzling fragments when seen individually. Each one of them avoids a figure, giving just a few inadequate notations. A flip-book of these drawings might provide a glimpse of the figure they are avoiding. In this sense the drawings comment on the practices of the past and are footnotes to de Kooning's own history. "The more successful this convention of instantaneity, the more history disappears. Ambition becomes more prudent and imitates humility. And as ambition is suppressed, humor increases. There is a history of laughter in de Kooning's work, and in these works the laughter is very peculiar. "Laughter," said Baudelaire, "comes from the idea of one's own superiority." But if one has given up that idea laughter becomes unnecessary. If it continues, it is as one sees it in these sixties paintings - a gallery of giggles. Perhaps they indicate a relief from past ambitions and a recovery of innocence. This brings us back full cycle. For innocence is connected with wiping out the past and turning an optimistic face to the future. It is connected with that dream that allowed de Kooning to fulfill his career under the disguise of failure. "Emerson wrote that the New World was made up of the party of Hope and the party of Memory. One is Utopian, the other Dystopian. The party of Hope is continually reborn in every immigrant. Whatever happens to him is unremarkable because it should. In avant-garde circles in Europe this idea was associated with Whitman. The expansive illusion of freedom does away with the past, for one is starting again. Yet the past the immigrant brings with him is projected into the future, for he can only define his expectations in terms of this past. It undergoes odd transformations, since the immigrant forgets he's brought it. "One can tentatively identify Whitman's anthropomorphic self-image spread across the future with de Kooning's art spread across history, across the past. The two can be superimposed without too much difficulty, although one is whole and the other, a century later, has suffered large losses. Every immigrant for a time thinks he is discovering America. Eventually he finds out he has discovered Europe idealized in terms of his own expectation. If the future is shaped by this memory, the past is resuscitated by this optimism. De Kooning discovered an idea of Europe that could only be experienced or discovered in America. He has always confused Hope and Memory, optimism and regret, history and a dream. He has confused them because he has so often used each to cancel the other-a way of making them interchangeable. No wonder an art caught in such a cat's cradle of illusions is itself a supreme fiction. In this fiction voice and myth are liable to confusion also. No wonder when we look at de Kooning's work we are impressed, above all, with its folly." Elaine and Bill, by Lee Hall. Examines the relationship of de Kooning and his wife in the context of the post-WWII New York art world. The Essential Willem De Kooning, by Catherine Morris. Small book, but excellent. Willem De Kooning, by Sally Yard. Nice monograph from Rizzoli. Willem De Kooning: Reflections in the Studio, by Edvard Lieber. An intimate account, primarily in de Kooning's own words, with candid photographs taken by his friend Lieber. Willem De Kooning: The Late Paintings, the 1980s, by Robert Storr. Features de Kooning's lyrical and beautiful final works. 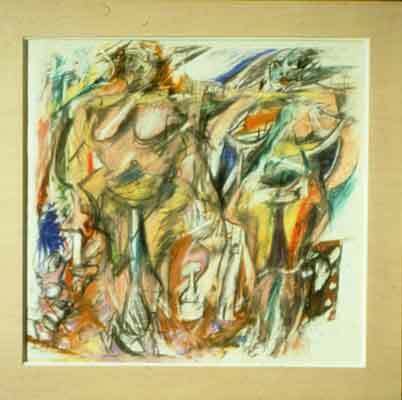 * Links to other de Kooning images online can be found at Artcyclopedia. Study for "Woman Number One"